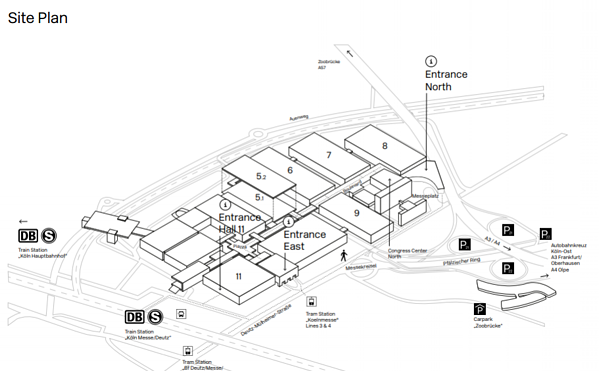 Before the event we are recommend you familiarise yourself with the DMEXCO floor plan. As can be seen in the plan below DMEXCO is split into 11 different halls. Each hall has a different focus – mobile marketing, multi-channel marketing, startups, services companies, etc. You will find VideoElephant in Hall 8. There are also multiple stages in each hall where keynote speeches and panel discussions take place. These talks will cover topics such as the new trends and future vision of digital marketing to practical information to help you refine your strategy. HERE is the link to the site map. The DMEXCO event has a dedicated app to help you navigate through the event. You can use the app to plan your visit, screen the exhibitors, choose the sessions you’d like to take part of and make notes. While at the event use the app to easily find where you need to go and keep track of the agenda. In addition, you can allow it to notify you about upcoming talks or discussions so you won’t miss anything important. DMEXCO events use push notifications to alert visitors of real time information, such as a change in the agenda, happy hours, and discounts for food. DMEXCO can be overwhelming for someone who is visiting for the first time. If you haven’t looked through the list of exhibitors already, we strongly recommend you to do so before attending. HERE is a link to the list of the exhibitors. To get the detailed agenda for DMEXCO we recommend you check out the Conference Guide. It contains a full list of stages and also events taking place each day. If you want to learn from industry leaders, the conference guide is helpful. Our suggestion is to review the full agenda, highlight the events you want to attend and set up reminders for these events on your phone using the DMEXCO app. Remember to try to give yourself a few minutes between each talk to allow yourself time to move between the halls and find a seat. HERE is the link to the Conference Guide. This year DMEXCO is expecting 40,000 visitors, 1,100 exhibitors, and 500 speakers from around the world. Don’t count on finding all of your “potential leads” in this huge event. Make sure to schedule meetings prior to arriving at the event. You can use the app to identify the most relevant people for you to meet and reach out, or alternatively work through social media or DMEXCO attendees list. Take into account that getting from one place to another takes time. So leave enough time in between meetings and sessions to find the next place, or try to schedule multiple meetings in a single location. The most important step is often the one that is overlooked. Having met lots of people and taken lots of contact details, do not forget to follow up after the event. Do not assume the person will remember you. They will also have met lots of people and you may get lost in the mix. So it is up to you to take the next step and develop relationships from your face to face meetings. DMEXCO is an annual trade fair and conference for digital marketing & advertising. The exposition and conference is the largest congress trade fair for the digital industry in Europe has been held in Cologne since 2009. The event aims to bring together industry leaders, marketing and media professionals, and tech pioneers involved in setting the digital agenda of the marketing world. DMEXCO 2018 is running from 12th - 13th September and will bring together 40,000 visitors, 1,100 exhibitors, and 500 speakers from around the world for a one-of-a-kind event.